Showings start 4/9. Peaceful country living! 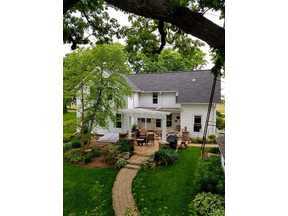 Beautiful farm house that has been well maintained & updated. Kitchen was remodeled in 2013 & includes Amish cabinets, wood floors & new appliances. Other updates include bathroom remodel on the main floor with laundry added as well, new carpet on the upper level in 2018. Roof replaced in 2008. Furnace & water heater have been replaced by owners. Guest house w/fireplace & 3/4 bath, large barn & steer shed. Heated shop w/loft. Pergola & stone patio lead to beautiful yard. 2.5 car garage. Measurements approx. Buyer to verify if important. Outbuildings sold as is.